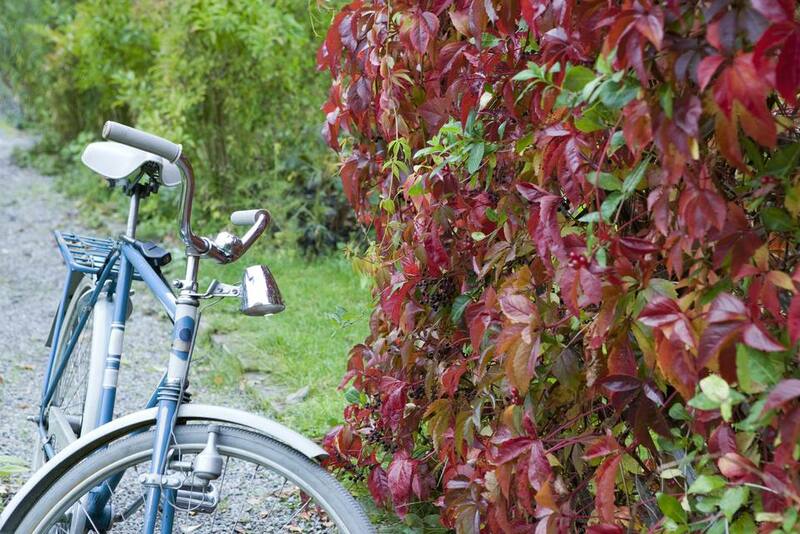 The Virginia creeper vine sports gorgeous fall foliage. A close relative of Boston ivy, the Virginia creeper can be used for ground cover or a climbing vine on stone walls and trellises, supported by its grasping tendrils. Its leaves have five leaflets and morph from their summer green into a fall foliage color ranging from reddish-orange to burgundy. This spectacular change should earn the plant a spot on any list of the top shrubs and vines for fall color. The flowers are not much to look at, but Virginia creeper berries are a pleasing dark blue and are enjoyed by birds. While it's true that there are problems associated with growing this plant, there are simple solutions you can learn to address each of these concerns. Keep some warnings about this vine in mind. It is a vigorous grower and may get out of hand if not kept in check with equal vigor. It is not a good plant choice if you seek low-maintenance landscaping. The sticky, disk-like appendages on its tendrils adhere to wall siding, making it difficult to remove. Although the tendrils don't penetrate and damage the wall themselves, removal could do damage. Don't grow it on walls unless you wish it to be permanent. If you want the look of a wall covered with Virginia creeper, but without the risk, install a sturdy trellis near the wall and grow Virginia creeper on the trellis (keeping it well trimmed). Virginia creeper will climb trees and cast shade on their leaves, thus depriving them of needed sunlight. Don't allow it to grow on specimen trees. Instead, train it onto garden arbors, onto pergolas, or onto fences. Another use for the plant is as a ground cover. Although it's a climbing vine, it will simply sprawl along the ground if not given support on which to climb. When used as a ground cover on a hillside, it can be effective for erosion control. Although one of the vines tolerant of shade, this plant is more likely to achieve its best autumn color if grown in full sun. At the southern end of its range, giving it partial shade is not such a bad idea, though. A suggested location is on a wall facing east or west. Grow Virginia creeper in well-drained soil. It will grow well in a variety of soil types, including clay, sand, or loam. It will tolerate a range of soil acidity and alkalinity. During its first growing season, you will need to water it regularly, with a deep watering. Once the vine is established, it only needs occasional deep watering. If there is extreme heat, you may need to water it more frequently. Parthenocissus quinquefolia is indigenous to eastern North America and can be grown in USDA plant hardiness zones 3 to 9. The plant should survive down to temperatures of -10 degrees Fahrenheit when dormant in winter. It can be damaged by a late frost after spring growth has started. You can feed Virginia creeper once per year in the spring with a general purpose fertilizer to keep it vigorous. Sprinkle granular fertilizer on the soil. Engelmann's ivy (P. quinquefolia var. engelmannii) This cultivar is considered less vigorous than the species plant. Some bronze color tends to creep into its otherwise red fall foliage, though. It clings well to walls and fences. "Monham" has leaves with white variegations. "Variegata" is also less vigorous, with yellow and white variegation of the leaves, which becomes pink and red in autumn. Another variation on the wild plant is Red Wall, but its fall foliage color can be disappointing, despite its promising name. The berries of the Virginia creeper contain amounts of oxalic acid that are toxic to humans, although birds can enjoy eating them without harm. Don't leave curious kids unattended around it. The sap contains needle-like oxalate crystals, which, for a small portion of the population, can irritate the skin and cause a rash. If you are sensitive, wear gloves when handling it. Because it's native to eastern North America, Virginia creeper cannot, technically, be listed as an invasive plant there. A plant that spreads out of control where it's native is said to be "aggressive" instead. Prune Virginia creeper vines well in the winter or early spring each year to keep them under control, especially if they threaten to grow over gutters or encroach on trees. Vines that have come detached will not reattach to a surface, so they should be trimmed away, as should any dead or diseased vines. Some folks dislike its aggressive growth habits and are intent on killing Virginia creeper. Since it grows so high, it's impractical to try killing a mature Virginia creeper by spraying its leaves. Instead, cut the vine's trunk (near ground level), then apply the strongest concentrate of glyphosate (Roundup) you can buy to the fresh wound. An organic method of killing Virginia creeper is to dig it out, but this is easier said than done, as the plant spreads via rhizomes. While Virginia creeper is a plant often mistaken for poison ivy, it doesn't have the urushiol toxin that causes the poison ivy rash. The key difference is that poison ivy (and poison oak) have three leaves on a stem, no more. Virginia creeper has five leaves on a stem.